Fa La La gifts on Zazzle! It’s almost Christmas, and baby simply cannot contain the exuberance. There are things to decorate: a tree, a gingerbread house, a doggy! There are very creative presents to make, Santa to see (must be brave), carols to sing, not to mention the big event itself. Come celebrate the season with humor and joy as everyone’s favorite baby puts a special spin on Christmas. Oh, baby! Leslie Patricelli’s one-haired wonder returns to revel in Christmas. 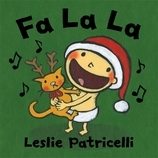 26 / 7" x 7"
Leslie Patricelli is the creator of a series of best-selling board books starring her beloved baby character. She is also the author-illustrator of Higher! Higher! as well as two stories about the Patterson Puppies and, more recently, Be Quite, Mike! She lives in Ketchum, Idaho.